For those of you who are looking forward to ideas that can convert their footwear into something glittery and classy, these projects will serve as rescue for you all. 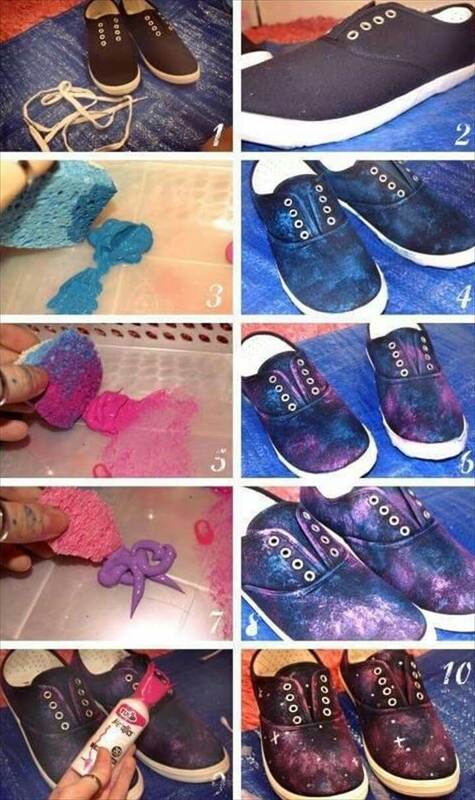 Here we have 10 DIY Shoe Makeovers – Fun Ideas For Wearable Art On Your Feet crazy and incredible ideas for turning your plain and dull footwear into glittery and sparkling. The first project are a pair of heels, decorated with glitter over the top portion and on the heels. These are a pair of pink colored velvet shoe and they the tips of these are dipped into golden glitter that really makes them unique and attractive like never before. 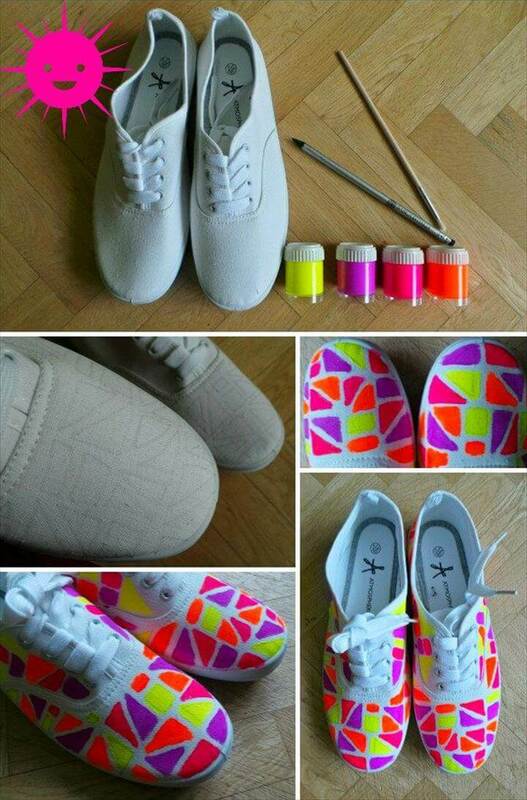 Next we have a pair of our regular pair of shoes turned into colorful and creative shoes that really attracts our attention as you cans see. This has made possible only with help of colorful fabric paints, some other basic some extra ordinarily creative ideas to paint them. This pair of shoe will attract every eye and you will be proud of all your efforts. Next we have another pair of shoe transformed with scrap fabric and looks brand new with just a small transformation and creativity. 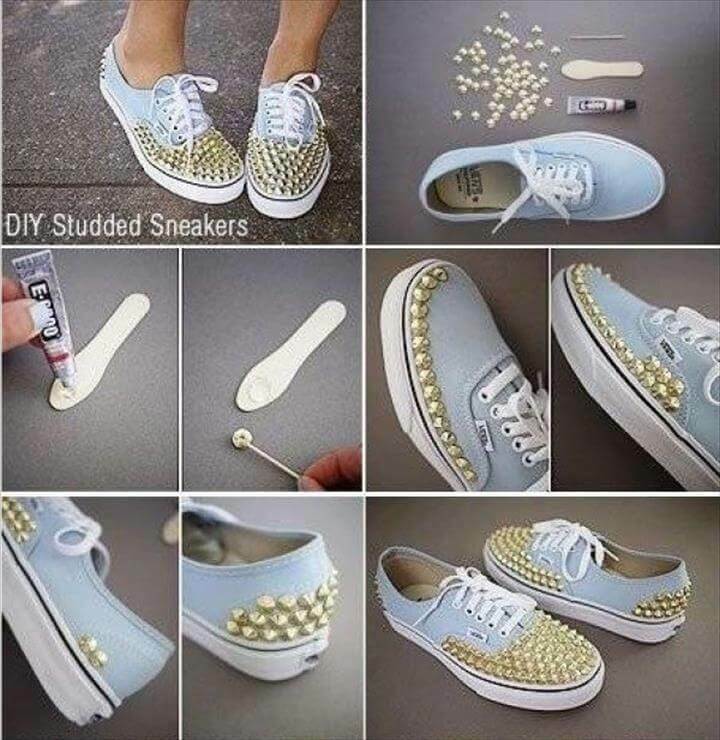 Not only this but you can also attach studs to your sneakers and make them look amazing and formal. For this project you will have to use super strong adhesive so that the look of the shoe is not disturbed. Besides this you must also try this sparkly shine and glitter for your shoes and see how the look of the shoe has been transformed completely. All these shoe make overs are not only easy but quick and budget friendly too. Share these ideas with others also so that they can also try these projects and explore their creativity like never before.